It’s soup time and we are in transit. 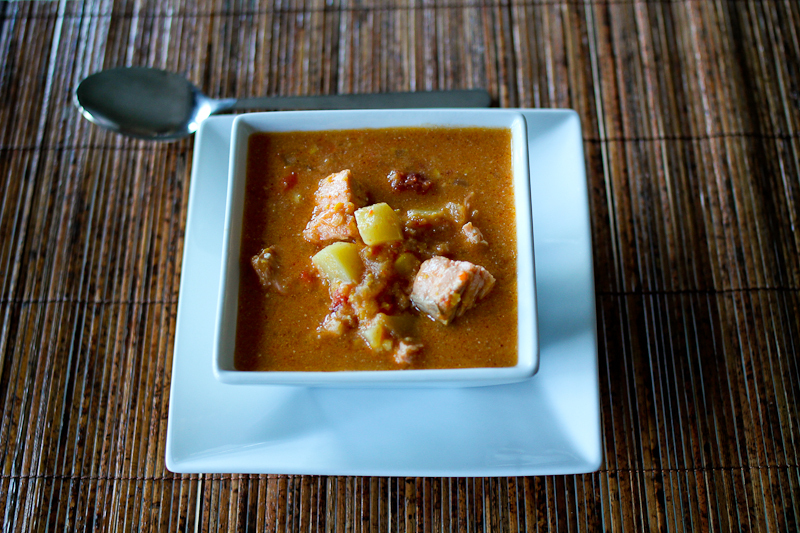 I created this salmon chowder about 10 years ago and it’s been a staple ever since. Especially during the cold season. Homy comfort food. Enjoy! Cut the onion, carrots, bell pepper and potatoes into cubes. Heat the oil, then add veggies and paprika and cook for 3-5 min over medium heat. Add the broth, tomato, corn, white wine and bay leaves. Bring to a boil and let simmer for about 10 min until the potatoes are tender. Remove the bay leaves and blend with a handheld blender until the soup is smooth, but still chunky. Cut the salmon into cubes and add to the soup. The salmon will cook in a few minutes. Add cream, season with soy sauce and salt. This entry was posted in Dinners in 30 min or less, From the sea, Soup time and tagged lakse chowder med majs, laksesuppe, laksesuppe med tomat, salmon chowder, salmon corn chowder, salmon tomato soup. Bookmark the permalink. Receiving your latest recipes feels like you’re still down the street. I love salmon, I must try this chowder! Derrick, Samantha and I LOVED it! I will make it again.